The ohrenhoch-Rumori_Kids will be filming with a smartphone the shadows of people at the playground Weichselpark, and ask them questions. Their real appearance is not filmed. 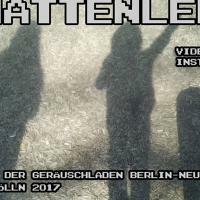 The voice is confronted with the shadow and vice versa, and the camera is transmitted by livestream to a screen at the Soundgallery ohrenhoch. At the same time you can see and hear the livestream on www.ohrenhoch.tv. SHADOW LIFE is moving image in context with audio and field recording. According to the situation - depending on the weather or technical incidents - you will see and hear a compilation of the SHADOW LIFE Video sessions of the ohrenhoch_Rumori-Kids. The ohrenhoch_Rumori-Kids are a group, an ensemble. They have most different cultural backgrounds. With the ohrenhoch_Rumori-Kids there are also refugee children; they accomplished admirable contributions for the project SHADOW LIFE. The risk of SHADOW LIFE is, that the sun has to shine. In this sense, SHADOW LIFE is an adventure. Is beauty possibly residing in darkness? Does the light-flooded, dazzling, shiny obscure the individuality, the unspectacular, the mysterious, the humorous? The permanently changing interplay of contingencies: the perceivable as the texture that connects individuals, cultures and things. The sun as starting point of light and shadow, transferred to technology. Lucky Luke claims that he is shooting faster than his own shadow. Do we understand the world better through technology or rather is the western culture thinkable without technology? The theme of SHADOW LIFE is intertwined with 'Soundactivism017 - Positioning' by ohrenhoch. Hearing, the voice, the language, participation are central instruments for a so-called (socialist) democratic togetherness. Do the voices or questions fade away unheard? Die ohrenhoch-Rumori_Kids are a mixed group of children between 5 and 14 years dealing and experimenting with hearing, listening, and consequent phenomena. In the weekly Audio School, the ohrenhoch-Kids learn, research and experiment. Starting from their own ideas they realise their projects with noises and sounds, on fixed media and with sound installations. The pedagogical basis is to meet the children at equal eye level and as fully-fledged members of the society.